J: After a day at the Victoria Vintage Fair, all the browsing made me hungry. It was almost the flip of a coin between Little Piggy and Stir It Up. Fernwood has a number of great eateries but when your nearly skint after spending $25 on one of Sir Walter Scott’s works, Little Piggy is more within one’s financial grasp. E: But you didn’t see me haggling, James. I managed to save a little so I could take us both out for some good eats. Victoria’s sudden bout of winter weather didn’t stop James and I from having a merry ol’ time in Fernwood. While dodging snow flurries, we headed into Little Piggy for a taste of Mexican. Mind you, near the end of the day, James was almost looking like a merry old snowman himself. For $16.50, we feasted on tacos and tostados. I asked for an extra one since I was feeling hungrier than a walrus. 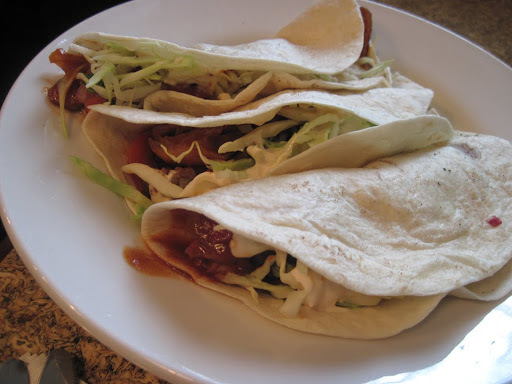 J: The soft tacos with chicken fingers were most welcome. I sunk my teeth into what I believe were locally grown ingredients. It certainly tasted as such. The spiciness of the taco was enough to warm my lips but at the same time it was cooled by the sour cream. E: And at the same time, the snow flurry picked up. Is that a sign? Mind you, given how fast the temperature was going down, if any part of the tostado itself was warmed prior, they certainly were room temperature by the time it hit my mouth. I enjoyed the flavour of the raised pork, black beans and cabbage. I tasted cilantro in the crunchy meal that I had. And I washed it all down with a tasty drink of black cherry soda by Boylan Bottling Company. They use cane sugar in their drinks, and I could taste the difference. J: Little Piggy offers some free range chicken and island bison among other edibles in their fridge (eggs anyone?). But since I was skint, I walked away with only two Boylan sodas (sugar cane cola and ginger ale). I really must return to Fernwood again but I think this time I’ll make it a dinner at the Fernwood Inn (ye ol George & Dragon) and a play at the Belfry Theatre. 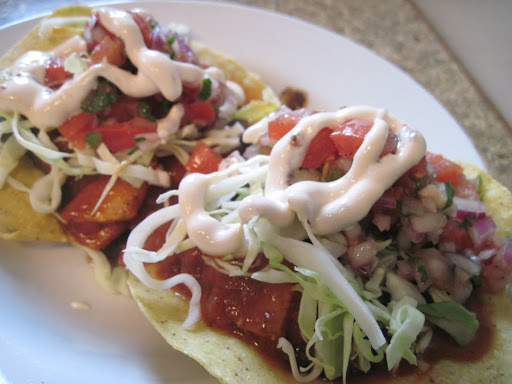 This entry was posted in Food and tagged Farm Fresh Products, Fernwood, Lunch, Mexican, North American. Bookmark the permalink. ← Victoria’s Best Pizza my Foot!